A great question that I think has a clear answer. No. Firstly, there is nothing new about providing answers, clues, hints etc. for puzzles and games. Think no further that the picture on the box of a jigsaw. Secondly, a player can often get stuck during game play. Should that mean they can’t go ahead to complete the game or puzzle? Of course not. Getting some help to get you back on track facilitates the opportunity to attempt the remaining challenges of the game. Take Samgine’s original room escape game called Boxed Inn. We built this with a series of very different challenges throughout the game play. The goal being to offer a variety of puzzles within the theme of the room escape. There are word, number, pattern recognition and spatial puzzles to solve. If word puzzles aren’t your strongest area, should you be deprived from completing the other challenges? We don’t think so which is why we offer a walkthrough for Boxed Inn. Thirdly, walkthroughs can be educational and help improve your skills. Take another Samgine original PaintBox. Part of the challenge of PaintBox is to complete it in the least number of moves. This can require adopting certain strategies to the sequence of your movies. 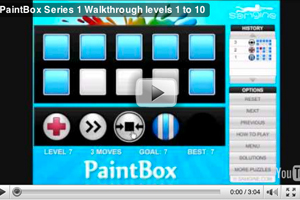 By taking a look at PaintBox walkthrough you can learn a maneuver to solve the level in an optimal number of moves. The player can then use this strategy they have now learned to solve subsequent levels in less moves. I would add one further thought to this question. Games and puzzles are certainly educational and can give your brain its much needed work out. However, they are not SAT’s but entertainment and should be fun and done at your pace, with or without out a little help.